I’m snacking on a bag of M&M’s right now. (In University of Florida colours, from Tampa). I’m not going to detail all the things I got that you can find easily (M&Ms, Newman’s Own Mint Cups, Ghiradelli Squares, Laffy Taffy, and so on, although each have significance to the sender). 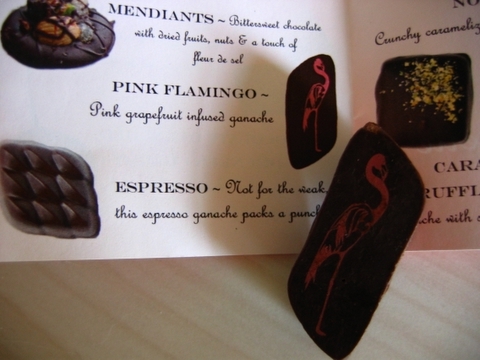 But I am going to tell you about some of the more unique candies I got, starting with this Pink Flamingo from Pix Patisserie in Portland. 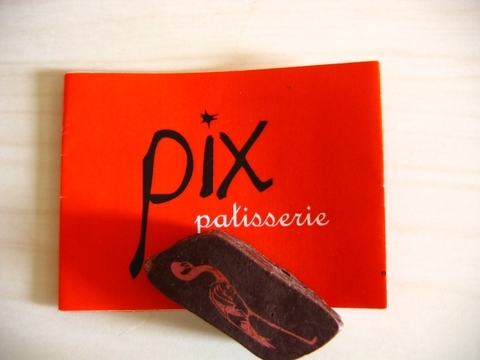 You may not be able to read the writing–it’s a pink grapefruit infused ganache, and it was awesome. There was a hint of crunch which felt like sugar (perhaps the grapefruit had been candies?) I’m not a big grapefruit fan, so I was surprised to find that I actually really liked this little ganache, the chocolate rich and luscious, contrasting beautifully with the tart, sour grapefruit. Great combination, and one I would never have thought up on my own.